Awesome spot for Bar Louie menu prices! Bar Louie is an American casual bar and dining establishment serving famous signature martinis and food items such as small plates, burgers, and sandwiches in a chic, lively atmosphere. Each creative dish pairs tradition and regional influence. Below are the latest Bar Louie menu prices. Bar Louie is a great place to unwind with co-workers after a long day in the office. Guests can choose from a menu of small plates and pair it with a refreshing drink such as a martini, mojito, margarita, or other handcrafted cocktails. Happy Hour is from 4:00-7: 00 pm. Be sure to check favorite location for exact times. There are several reasons for joining Louie’s Crew. Just for joining, guests receive a free appetizer. Good start. Your inbox will be filled with special discounts and offers, news about members-only events and happenings plus chances to score free food. Great finish. Sign-up is quick and free. Bar Louie gift cards are the perfect last minute gift. Cards can be ordered online or a Bar Louie location. Online orders will be shipped directly to the recipient via postal service. 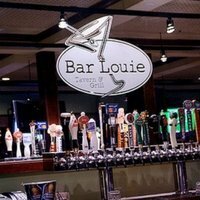 Candidates looking to work for a unique concept should consider Bar Louie. Candidates must have integrity, be willing to provide exceptional customer service and be a team player. Bar Louie offers potential candidates a great working environment where being different is cool and being creative is encouraged. Head over to the Career page on the official Bar Louie website to learn more about the concept, the benefits, and training, and view the list of current openings. If something catches your eye, apply online! The Bar Louie concept was launched in 1991. BL Restaurant Operations, doing business as Bar Louie, is headquartered in Addison, Texas, and owned by Roger Greenfield, Ted Kasimir, and Sun Capital Partners. Today, there are over 90 locations in the U.S.
For more information about Bar Louie, please visit their website.